Image at top: Fully eclipsed moon on January 31, 2018, 20 minutes into totality, via Eliot Herman in Tucson, Arizona. The full moon on the night of July 27-28, 2018, presents the longest total lunar eclipse of the 21st century (2001 to 2100). The total phase of the eclipse – called the totality – spans 1 hour 42 minutes and 57 seconds. That’s in contrast to the shortest total lunar eclipse of this century, which occurred on April 4, 2015, and lasted 4 minutes and 48 seconds. 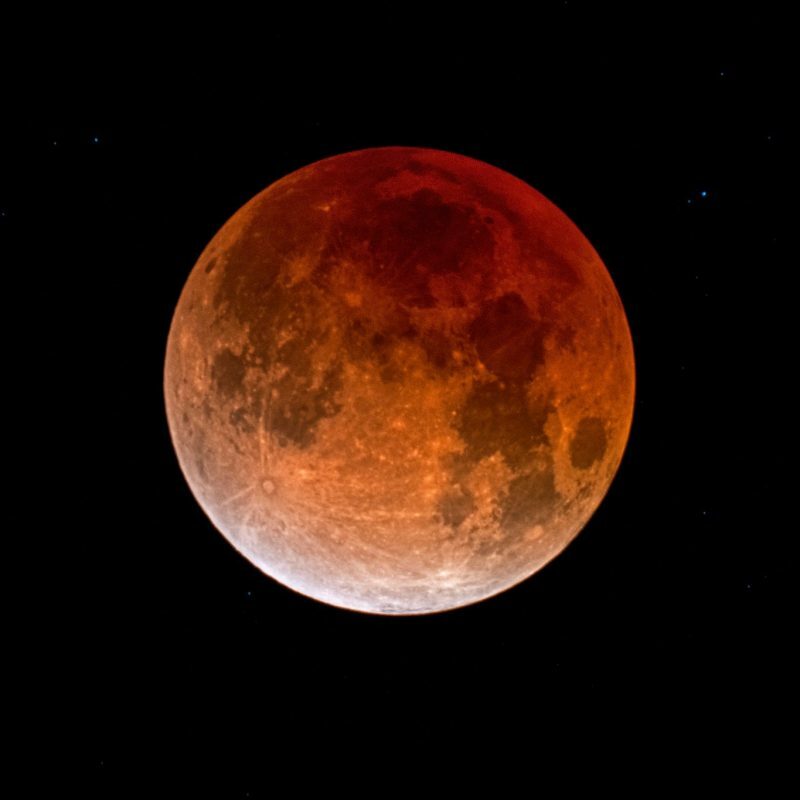 And it’s in contrast to 2018’s other total lunar eclipse – on January 31, 2018 – whose totality lasted 1 hour and 16 minutes. Adding to the excitement on eclipse night … this eclipse will happen on the same night that Earth is passing between the sun and Mars, placing Mars at opposition in our sky. In one of the sky’s wonderful coincidences, the Mars opposition happens on July 27, too. It’s not just any Mars opposition, but the best Mars opposition since 2003. Mars is very bright and red throughout July and August, 2018. But eclipse night will be a very special night. On July 27, the sun, Earth and moon are aligned – placing the moon opposite the sun in our sky – producing an eclipse as Earth’s shadow falls on the moon’s face. On the same night, the sun, Earth and Mars are also aligned, bringing Mars also opposite the sun in our sky, just like the full moon. That’s fun to think about, but there’s more for those who plan to observe the eclipse. Picture it, if you will. During the long total phase of the July 27, 2018, lunar eclipse – the totality – the moon will turn red from sunlight filtering through Earth’s atmosphere onto the moon’s surface. And Mars will be near the moon, exceptionally bright – brighter than since 2003 – and red in color also. Red moon, red Mars … does it get any better? Expect some great photos! 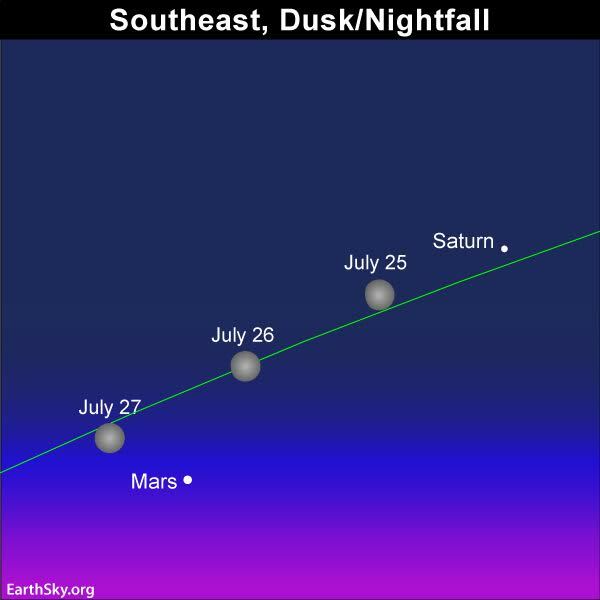 The eclipsed moon on July 27 will be close to the planet Mars, which – in July and August 2018 – is at the peak of its very special brightness as seen from Earth. Read more. Clouded out on eclipse night, or on the wrong side of Earth? Never fear. 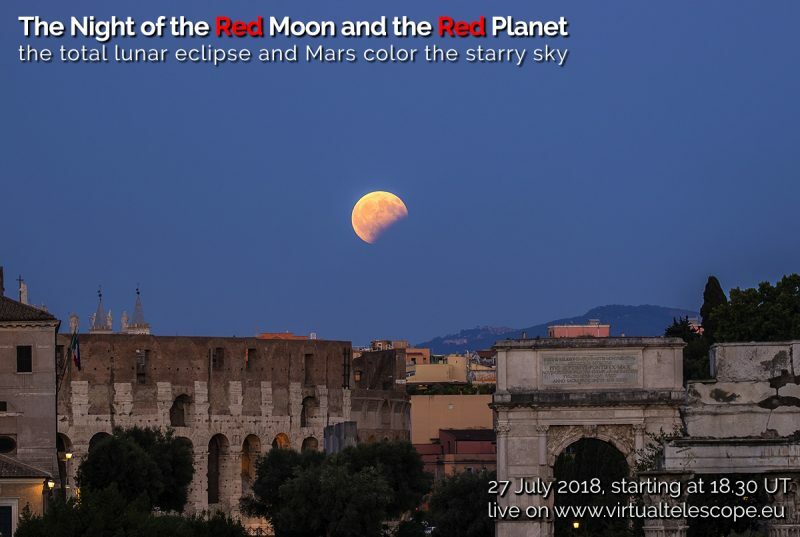 The Virtual Telescope Project in Rome is offering a free live viewing. Click here for details. It starts at 18:30 UTC on July 27. That’s 2:30 p.m. EDT on July 27; translate UTC to your time. 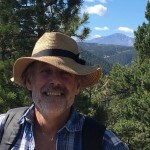 Here’s another option for following the eclipse, live, free, online. This one offers a commentary in Spanish. The live broadcast of sky-live.tv starts at 18:20 UTC. 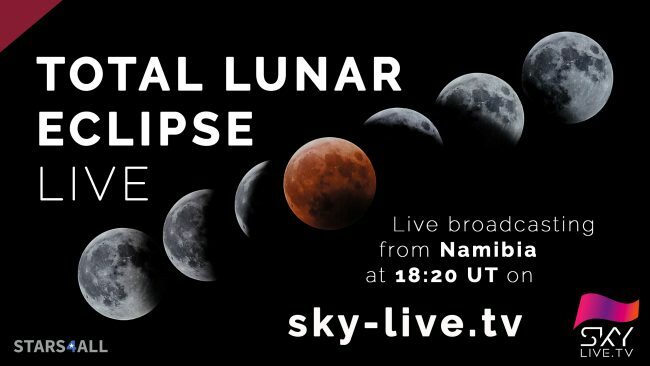 It will cover both the partial and total eclipse with a commented-cam (in Spanish) and a sky-cam (only music), both located in Namibia (Africa). Click here for information. 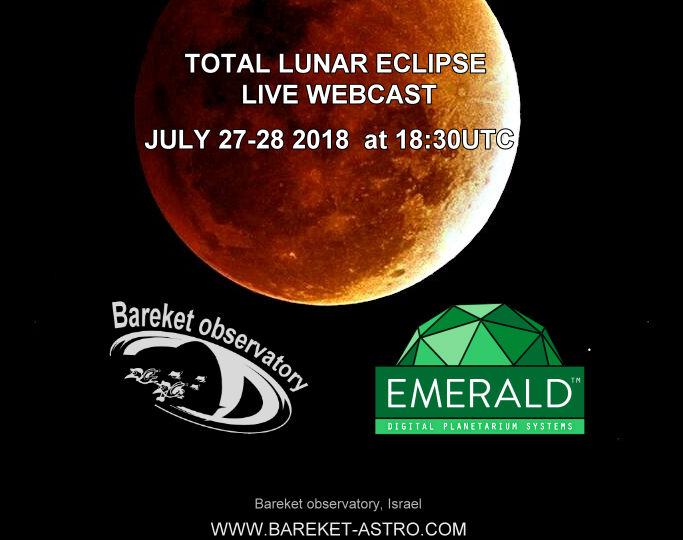 Free live lunar eclipse webcast from Bareket Observatory in Israel. Friday, July 27, 2018. This special webcast will start at 18:30 UTC and last about 5 hours. For more information, visit Bareket’s live page. Now for the bad news for us in North America. This lunar eclipse is primarily visible from the world’s Eastern Hemisphere (Europe, Africa, Asia, Australia and New Zealand). South America, at least in part, can watch the final stages of the eclipse just after sunset July 27, whereas New Zealand will catch the beginning stages of the eclipse before sunrise July 28. North America, most of the Arctic and much of the Pacific Ocean will miss out entirely, as shown on the worldwide map below. Worldwide map of the July 27, 2018, total lunar eclipse, via Fred Espenak’s EclipseWise. The greatest eclipse (20:22 UTC) takes place at or around midnight for Madagascar and the Middle East. Europe and Africa view the greatest eclipse during the evening hours (sometime between sunset and midnight on July 27), whereas most of Asia, Indonesia and Australia view the greatest eclipse in the morning (sometime between midnight and sunrise on July 28). We give you the eclipse times in Universal Time (UTC) below. You must convert these eclipse times from Universal Time into your local time. Here’s how. If it’s easier for you, the local times of the eclipse are available at TimeandDate.com (remember to put your place or country in the search box). Earth’s shadow has two parts: a dark inner umbra and lighter surrounding penumbra. When Earth’s penumbral shadow falls on the moon, it creates a very subtle eclipse – a shading on the moon’s surface. When the darker umbral shadow falls on the moon, it appears as if a “bite” has been taken from the moon’s face. Illustration via astro.washington.edu. The moon crosses the ecliptic (Earth’s orbital plane) from north to south. This descending node Saros series starts when the moon first clips the southernmost part (bottom) of Earth’s shadow and then migrates northward (upward) with each succeeding Saros period of 18.031 years. Midway through the Saros series, the full moon passes through the center of Earth’s shadow for a maximally long total lunar eclipse. Saros Series 129, of which the total lunar eclipse on July 27, 2018, is a part, lasts for a total of 1,262 years. Image via Matthew Zimmerman. On July 27, 2018, the center of the lunar disk will swing a tiny bit north of the shadow’s center, so this total lunar eclipse with a duration of 1 hour and 43 minutes will be a few minutes shy of the maximum duration possible (1 hour and 47 minutes). Even so, this July 2018 total lunar eclipse counts as a whopper, giving us the longest total lunar eclipse of the 21st century. The longest total lunar eclipses of the 20th and 21st centuries both take place in July, which is of consequence. That’s because yearly, in early July, the Earth swings out to aphelion – its farthest point from the sun for the year. At aphelion, the Earth’s dark umbral shadow reaches its maximum length (and width) for the year. 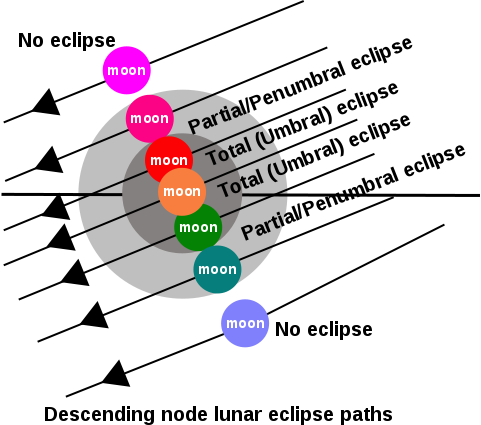 All else being equal (moon’s distance and centrality of eclipse), the greater width of the Earth’s umbra in July means a longer total lunar eclipse. Therefore, long-lasting total lunar eclipses tend to take place in a Northern Hemisphere summer (or Southern Hemisphere winter) because the umbra is wider at this time of year. The full moon will plunge deeply into the Earth’s shadow on the night of July 27-28, 2018. Depending on atmospheric conditions, this could be an especially dark total eclipse, though you won’t know for sure unless you look! 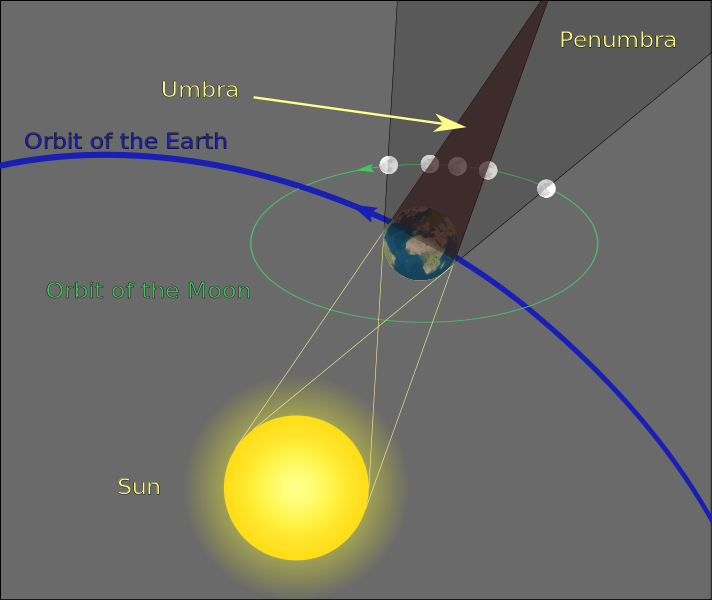 During a total lunar eclipse, the moon always passes through Earth’s very light penumbral shadow before and after its journey through the dark umbra. Bottom line: July 27, 2018, brings the longest total eclipse of the moon of the 21st century. It happens when the most distant and smallest full moon of the year passes through the center of the Earth’s shadow, which is at its widest in July. And it happens on a night when the moon is near Mars, which also comes to opposition on July 27. What a night!